UP Board 10th 12th Calendar 2018 Madhyamik Shiksha Parishad said to declared 10th and 12th Exam Calendar on 18 to 25 September 2018. Previous date was said to be said within two days but some technical fault or official reason the date delayed to 1 week more. Education Minister of Uttar Pradesh is Dr. Dinesh Sharma who also holds responsible of Deputy Chief Minister in His Region, Keshav Prashad Maurya (Deputy Chief Minister). Latest Update 15 September From 7th February Madhyamik Shiksha Parishad is conducting written exam and Deputy CM hints to announced the UP 10TH 12TH Time Table after this declaration all board officer and employee started making papers of UP Board 10th Calendar and 12th Exam Calendar respectedely. We hope written exam dates of UP Board 10TH Date Sheet 2019 may be updated in September but 100% percent sure that UP Board 12th Date Sheet 2019 published in October. 1. 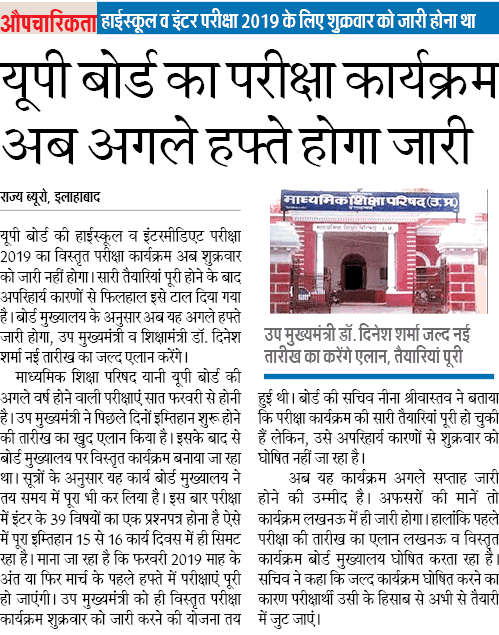 In 2019 UP Board first time instructed 1 papers of Intermediate 39 Subjects. 2. exam ends between 15 to 16 days of time. 3. 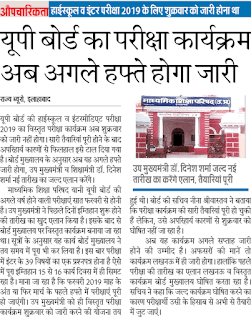 UP Board Sachiv Name Nina Shrivastava," She Suggested all students to starts preparation on their upcoming exam.